Bank Nifty opened flat at 27261, registers low 26242 and bounced back to register day’s high 27433 but didn’t sustain at higher level and decline back again by more than 350 points to register day’s fresh low 27045 and finally closed at 151 points down at 27115. Friday, one more decline towards 27142-27045 was expected and 27385 was the Pattern Negation Point on upside. Trading strategy was to sell Bank Nifty if get in 27310-27380 range using exact stoploss of 27387 expecting decline towards 27142-27045. Bank Nifty opened at 27261 and bounced straightway above suggested stoploss 27387 within fraction after opening. So, our trade was negated at very opening. Now, we need to analyze fresh charts to calculate further move. This is 05 Hourly time bar chart of Bank Nifty covering move from all time high 28388 which I am expecting as start of inner wave  of wave (iii). Wave  may be completed from 28388-24240 as Simple Zigzag Correction. From low, its seems wave completed at 25915 may be wave (i), wave completed at 24353 may be wave (ii), wave (iii) may be completed at 27369, wave (iv) may be completed at 26408 and wave (v) may be completed at 27754 or still in progress. Wave (v) achieved 38% projection after breaking above 27603 whereas 61% projection is placed at 28341 which may or may not be achieved. 23%-38% retracement of progress of impulse started from low 24240 is placed at 26924-26411 which is the expected range on downside if impulse already completed from 24240-27754. Now, let’s analyze the decline started from high 27754 on separate lowest time frame chart to check inner/immediate counts and immediate levels. This is 30 Minute time bar chart of Bank Nifty covering move from high 27754. It seems wave completed from 27754-27182 may be wave (A or 1), wave (B or 2) may be completed at 27622 and wave (C or 3) may be in progress from 27622. Within wave (C or 3), it seems wave  may be completed at 27385, wave  may be competed 27564 and wave  may be completed at 27045 or still in progress. 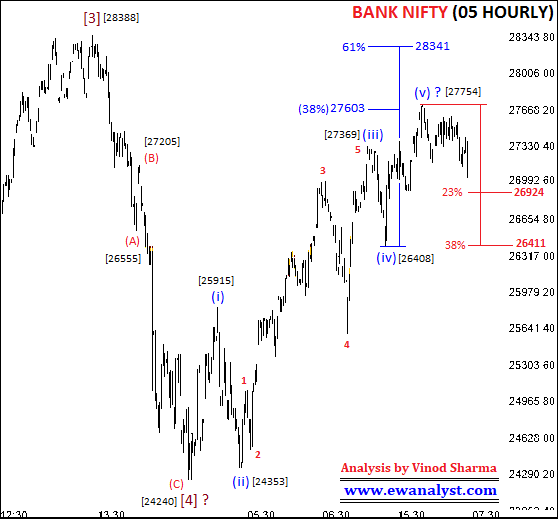 23% -38% retracement for wave  is placed at 27167-27243 which is the immediate resistance range from where further one more decline of minimum 199-321 points is possible in coming session. Same 27243 is the breakeven point on upside with 27385 as Pattern Negation Point. There is no major change in outlook, Bank Nifty still in negative zone and there is possibility of further one more decline of minimum 199-321 points either from present level or somewhere around from immediate resistance range 27167-27243 without breaking much higher above 27243. 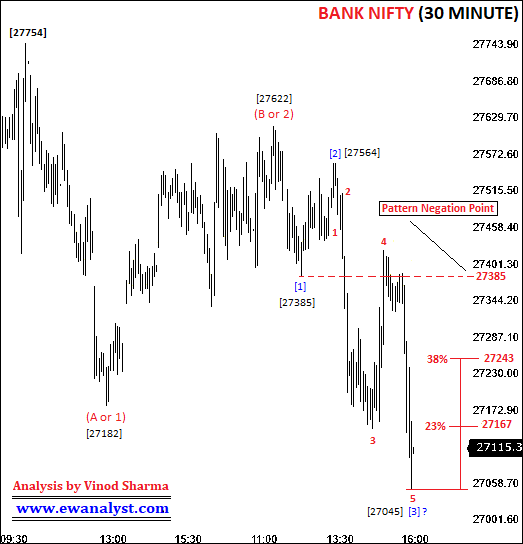 27243 is immediate breakeven point on upside with 27385 as pattern negation point and Bank Nifty even if touches 27386 will negate the whole pattern marked on 15 minutes chart and it can bounce towards 27564-27622 again. Bank Nifty 27100 Put of 31st Jan expiry can be bought if get Bank Nifty in 27243-27385 range using exact stoploss of 27387 expecting decline towards 27045-26923. Book profit or trail stoploss after seeing reasonable profit. Otherwise Bank Nifty even if touches 27386 will negate the whole pattern marked on 15 minutes chart and it can bounce towards 27564-27622 again but entry levels and stoploss for buying can be calculated after breakout only.